The HCG diet program has offered our customers a lot over the years. We were one of the first HCG diet drops suppliers on the web, and certainly the first real HCG drops supplier, but now because of how things have changed so much, we are one of the few still left at all! Still, it is of paramount importance to us to continue to supply our customers with top notch weight loss from our HCG Plus drops. Within a few weeks, we will be offering full 16 page diet/recipe guides in print. These guides will offer absolutely essential information, along with a host of other awesome features, including two pages of weight trackers with a day to day breakdown. No other booklet you will find can offer you more than these will. For now, however, customers are going to be receiving this via email until they arrive in print. We’re anxious to help you get started on your HCG diet plan, and succeed along the way! Just what is in this guide? 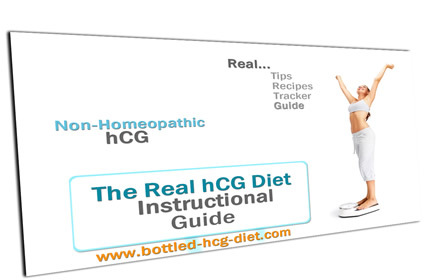 Well you have to order to find out of course, but the guide contains a breakdown of each phase of the HCG diet plan, including a do’s and don’ts list for what can be eaten in phase 2, as well as step by step guides for each phase. Along with that comes instructions for your HCG Plus and directions for the diet itself. Also we’re throwing in 6 pages of awesome recipes that should get your mind in gear for this weight loss journey! These recipes are all HCG diet approved, but they’re also great to give you ideas about how to maximize your HCG diet program and its results. We have had over 8000 customers succeed with our program so far, and many of them come back bringing friends and family as well. People such as Martha, who recently just hit 57 pounds lost while using our program, or Dennis, who lost 25 pounds in his first 14 days! These results are fairly typical, and to be honest, expected. HCG Plus is the most potent and concentrated HCG drops you will find anywhere on the web. We only provide the highest quality drops and customer service for your order. These booklets are a step along with that mission of premier customer results and service all for a low price. You won’t find us here at HCG Plus charging $79 for a 1 oz bottle, without any guarantee or return policy! We try to lower our prices and increase our services every day. These booklets will not raise our prices one iota, but they will be just another step in our mission to help you lose weight. The HCG diet plan has proven to be the most powerful and longest lasting weight loss program in the world. Physicians are now prescribing it more than any other treatment for obesity, because the results are simply so consistent and excellent. Customers using the HCG diet often experience weight loss in the 20-30 pounds/regimen (for a classic regimen) and it’s no surprise our customers experience much of the same. When we tell our customers to expect fast weight loss, they are rightly skeptical. But it is clear to them without too much time passing that we are a different kind of HCG company. We care about your results, and we want you to succeed at all costs. We are providing these new booklets, without increasing our prices, because it is so important to us! You will never have to wonder if we’re looking out for you once you see what information we’re giving away for free. You will achieve maximum benefits with the HCG diet program with HCG Plus, because we’re real, and we really care about you. When I started HCG Plus, I was skeptical. However, In the first week I lost 14 pounds!